description for "Winter Squash and Pumpkins: Cucurbita maxima, 'Hopi Orange'"
Cucurbita maxima 'Hopi Orange' has tasty, juicy and fibrous flesh perfect for pies and soups. 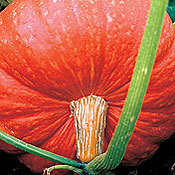 Fruits are produced on vigorous vines yielding pumpkin-shaped fruits that are excellent keepers. 'Hopi Orange' looks great in an array along with other winter squashes of different colors and shapes. Planting depth: .5-1 inch. Days to germination: 3-7 days. 90 days to maturity. reviews for "Winter Squash and Pumpkins: Cucurbita maxima, 'Hopi Orange'"